Lapointe, Pierre Louis. "Saint-Romuald". The Canadian Encyclopedia, 17 July 2015, Historica Canada. https://www.thecanadianencyclopedia.ca/en/article/saint-romuald. Accessed 19 April 2019. Saint-Romuald was first settled in 1651 as a fishing establishment by a Québec merchant, Eustache Lambert. But it was agriculture which became the mainstay of economic life until the middle of the 19th century when Saint-Romuald became a sawmilling town. Saint-Romuald, Qué, City, pop 10 825 (2001c), 10 604 (1996c), 9830 (1991c), area 17.94 km2, inc 1965, is located on the South Shore of the St Lawrence River, across from Sillery, 19 km south of QUÉBEC CITY. 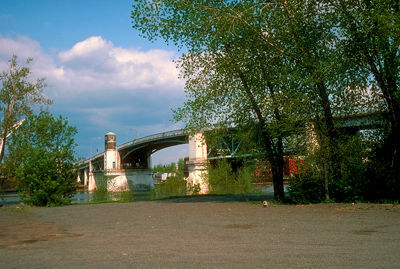 Two important tributaries of the St Lawrence, the Rivière Etchemin and Rivière CHAUDIÈRE, as well as the smaller Rivière à la Scie, flow into the St Lawrence here, giving Saint-Romuald its picturesque quality. Towering overhead is the old Québec Bridge, the longest cantilever bridge in the world. 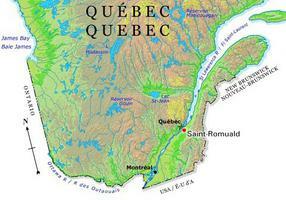 Saint-Romuald was first settled in 1651 as a fishing establishment by a Québec merchant, Eustache Lambert. But it was agriculture which became the mainstay of economic life until the middle of the 19th century when Saint-Romuald became a sawmilling town. Under the name of Saint-Romuald-d'Etchemin, it was set up as a parish municipality in 1853. The name was given in honour of St Romuald (952-1027) and the native people of the area, the Etchemin. It became a town in 1963 and 2 years later a city, when it merged with the municipality of Saint-Télesphore. In 1982 the name was shortened to Saint-Romuald. The architectural heritage of Saint-Romuald is witness to the city's evolution and includes the old post office (1929), which houses a display on postal history and a stamp museum; the church (1855), which contains the works of Lauréat Vallières, a renowned local sculptor; and the Cistercian Abbey. The economic backbone of the city is its industrial park.